There are three common types or scales (sizes) of model train tracks, cars and layouts. The smallest of these is the N Gauge Train Set. The N gauge set ups are the least expensive to work with and need the least amount of space. N gauge refers to the distance between the rails on the tracks at 9 mm or 0.354 in. 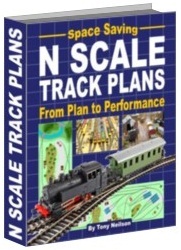 The scale for N gauge ranges from 1:148 to 1:160. What these ratio numbers mean, is that the N scale item is 148 to 160 times smaller than the real actual item. N scale trains and accessories, including buildings, have been available since about 1927. However it did not really become popular until 1960 with the introduction of the Rapido 20 at the German Nuremberg Train Show. The Arnold Company introduced this scale at this show. Then in the following years other companies such as Lone Star, MiniTrix, Lima and Riverossi also jumped into the fray with N scale products including buildings and building kits. N scale is most popular in places like Japan, where space is at a premium and more trains, buildings and scenery can be pushed into a smaller space. HO scale is most popular in the US and is number 1 worldwide with N gauge at number 2. The UK equivalent to HO scale is OO gauge, although there is a slight difference in size. O gauge is harder to find. By 1962 the N Gauge train sets manufacturers had all agreed to produce and recognize one standard definition and size of the voltage, gauge, type of couplers and height of the tracks. Arnold Manufacturing, who produced the first Rapido later shared the design for their couplings with the other N gauge manufacturers in order to standardize the gauge. Lone Star discontinued making electric trains in 1964. Arnold made an entire line of N scale in the 1960’s including GG1 engines, passenger and freight cars, buildings, structures, track and accessories. The Arnold line was unbroken until the company went into bankruptcy in 1990 and the assets were purchased by Rivarossi. By 2002, Rovarossi had also declared bankruptcy and the assets were then sold to Hornby who currently produces trains under the Arnold name. Things have come full circle for the Arnold brand. Another player in the N line in the 1960’s was Con-Cor made in Japan by Kato (Sekisui) and their products included the PA1 engine, freight trains, passenger trains, a bullet nose 4-6-4 Hudson, a NYC Commodore Hudson and a gas turbine. They sold building kits and corrugated passenger cars made by other manufacturers. They sold Rivarossi manufactured diesel and steam engines in late 1970 under the Con-Cor label. Committed to offering the largest possible array of trains, Con-Cor also sold Roco, Fleishmann, Mehanotehnika and Kato among others. They also produced a journal called TrainLog. In 1967 Atlas Tool Company started offering a wide array of complete N gauge sets with kits from Rivarossi, Roco, and Mehanotehnika. There were diesel and steam engines, freight cars and kits for freight cars. Other kits offered were made by Faller and Pola. In addition, Atlas offered industrial switcher models, helium tank cars, stock cars and vinegar tank cars. Others offered were flat cars, center-flow hoppers, three-bay and four bay hoppers, refrigerator cars, gondolas, chemical tank cars and transfer cabooses. In the early 70’s the boom continued with diesels by Roco and freight cars made in New Jersey by Atlas. Atlas offered an Alco RS3 in 1983 that was made in Japan by Kato. This would continue with Kato products till the end of the 1980’s. Then in 1990 Minitrix joined the list of bankrupt train manufacturers and suppliers. Their assets were purchased by Marklin who began making them in the 1990’s. Bachmann became another major player in the N gauge train in the 1980’s. There were new manufacturers, cars and engines in the 1990’s and by the end of the decade Lima and Arnold were both lost to bankruptcy. Roco went into bankruptcy in 2005 and the brand is now under new ownership. As previously mentioned the Arnold name continues under the Hornby brand today. In other articles we have looked at what it takes and what it costs to build a custom N scale layout. 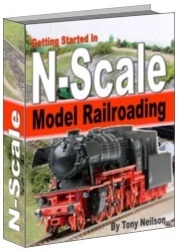 Here we will look at what it costs and what is involved in building an N scale train layout with a kit. You can buy a wide variety of model railroad kits from several different manufacturers or distributors, in a variety of price ranges. However there are not that many complete layout kits that include not just the patterns and layouts items, the tracks and scenery but also some have structures and buildings as well. They range in quality and brands. Here are a few examples of layout kits available from eBay, Amazon and Craigslist. NOTE: The following is a guide only. These were advertised at the time of writing this article, so may or may not be typical of what is currently available. The size of the layout this kit makes is 3’X6’. This is not a beginner’s kit. It is only recommended for those model railroaders who are experienced and serious. This kit includes all the subterrain and terrain components, along with all the needed landscaping materials. It also includes a full size track plan preprinted on the base. You can easily expand on this base and you can either use it as a module or it can stand on its own. This kit also includes a road system, but not the streets, sidewalks, parking lots and paved areas. The kit includes boards, connectors, foam board and foam risers, track-bed, plaster cloth, complete road system, turf colors, light gray fine ballast, field grass, cement and sprayer head for scenery, rock molds, foam pads, black base paint, earth pigment, liquid color pigments, trees, clumps in foliage colors, tunnel culverts and portals, tack glue, and profile patterns. This kit includes a painted 48’X30” layout molded into one piece. No tools are needed as there are no pieces to connect. The shell is of high impact polystyrene that is rugged and light. It is designed to use the snap track made by Atlas. The track easily snaps together or comes apart. The layout can be used with other tracks as well. All of the basic scenery design is already molded into the base – there are hills, mountains, grades, ponds, roads and streams. There is no need to frame it with wood, plaster or screen wire. You simply glue your track to the layout with any styrene glue. The design is a figure 8 that is inverted and plenty of switching available. The layout is 4’X 2 1/2’ and only weighs about 12 pounds. This layout is for one track with a western desert theme. The railroad layout includes a creek, dry ravine and train station. It is made of wood and foam board so that it is light and easy to carry and move as well as being very tough. No structures are included but one power pack is included. The layout is 48 ½’ X 25 ½” X 8 ½” and it weighs about 10 pounds. Included is a power pack, a semi-truck and trailer, two spur tracks, track cleaner. This kit has the layout and the attached track for a radius of 7 ½”. There are plenty of curves, twists, overhead trestles, roadways, mountain passes and prewired Atlas track. This layout is only 3’X4’ so it can fit just about anywhere. Each kit is handmade and hand painted. They are made from wood, gravel, glue and screws. The layout does not include structures, scenery or accessories and weighs only 35 pounds. It can be expanded by connecting it to another layout. It does include a two level layout with 25 feet of Atlas track already laid and two bridges with on track re-railer. So you can see that even the kits are not inexpensive but they are not in the same range as the $1000-4000 custom made layouts you can also purchase. Your other choice is to make your N scale train layout by yourself from scratch without a kit.